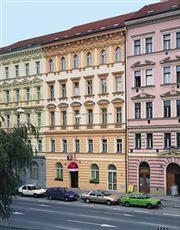 Situated in the centre of Prague, in the residential and business district of I. P. Pavlova, within walking distance of Wenceslas Square, the National Museum, the Prague Congress Centre, and all major historical sights. This elegant hotel housed in a nice building from 1910 features accommodation with studio rooms of high standard: large, light and quiet (particularly if they open on the yard). Double rooms, which can also be used as single, or triple with an extra bed, are parqueted, with high ceilings, and decorated with lavishly design furniture and fabrics. A cupboard elegantly dissimulates a tiny though complete kitchenette: with stove, fridgeminibar, sink, and dishes. Even more comfort is provided in the 2 Penthouse Suites: with a living room downstairs and the bedroom on the mezzanine. All rooms are fitted with first class equipment: satellite TV, IDD telephone, and a large safe (perfect for keeping your laptop computer). Rooms on the street side have air-conditioning during the summer months. Bathrooms are well appointed with shower and hair-dryer. Good range of services: featuring 24 hour reception, small meeting room, lobby bar, garage parking on request for 450, CZK per day, internet corner, laundry service and all business and tourist information. Ideal for those looking for high comfort and privacy at exceptional value in a strategic downtown location.